However entangled our lives are in virtual spaces, it is in the physical space that we exist. For this reason, human attention is most easily directed at where visual and other sensory stimuli are. The resulting sensory feedback from interacting with the source of these stimuli further enriches the experience we have in the physical space. Libraries can take advantage of this fact in order to bring users’ fleeting attention to their often-invisible online collections. So far, our experience on the Internet, where we spend so much time, is still mostly limited to one or two sensory stimuli and provides little or no sensory feedback. A library’s online resources, often touted for its 24/7 accessibility anywhere, are no exception to this limitation. 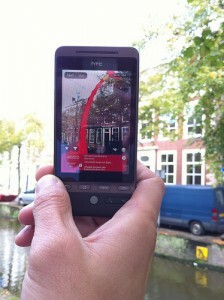 Flickr - "augmented reality game bibliotheek deventer"
Think about new library books, for example. The print ones are usually prominently displayed at a library lobby area attracting library visitors to walk up and browse them in the physical space. By thumbing through a new book and moving back and forth from the table of contents to different chapters, we can quickly get a sense of what kind of a book it is and decide whether we want to further read the book or not. The tactile, olfactory, visual, and auditory sensory input that we get from thumbing through a newly printed book with fresh ink contributes to making this experience enjoyable and memorable at the same time. Now compare this experience with reading a library Web page with the list of new online library books on a computer screen. Each book is reduced to a string of words and a hyperlink. It is hard to provide any engaging experience with a string of words and a hyperlink. 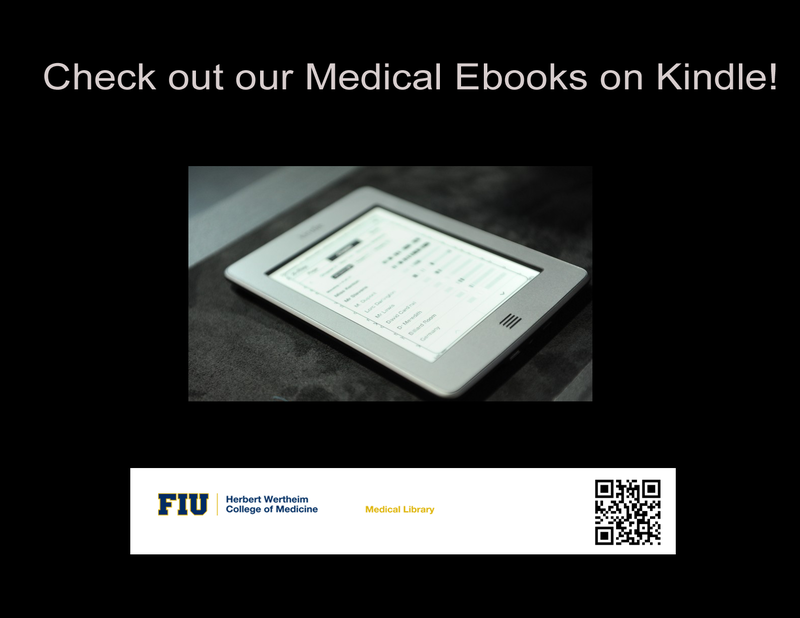 Like many libraries, Florida International University (FIU) Library started an e-book reader lending program that circulates e-book readers. Each reader comes with more than one hundred titles that have been selected by subject librarians. 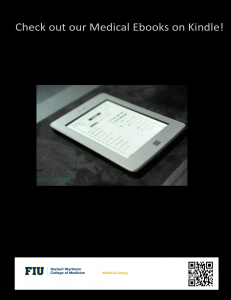 But how can a library make these library e-books on e-book readers noticed by library users? How can a library help a user to quickly figure out what books are available on, say, a library Kindle device when those are specifically what the user is looking for? Well, if a user runs a keyword search in the library’s online catalog, say, with ‘Kindle,’ s/he will find more than sufficient information since the library has already neatly cataloged all titles available on the Kindle device there. But many users may fail to try this or even be unaware of the new e-book reader lending program in the first place. The e-book reader lending program offers a great service to library users. However, the library e-books offered on the e-book readers can be largely invisible to users who tend to think that what they can see in a library is all a library has. The problem can be solved by giving some physical presence to e-books on the library’s e-book readers using a dummy bookmark on the stacks. This is particularly effective as it quickly captures users’ attention while they are already browsing the library stacks looking for something to read. Users are familiar with a dummy book on physical shelves that marks a print title that is often looked for under different names or the recent change of the location of a title. 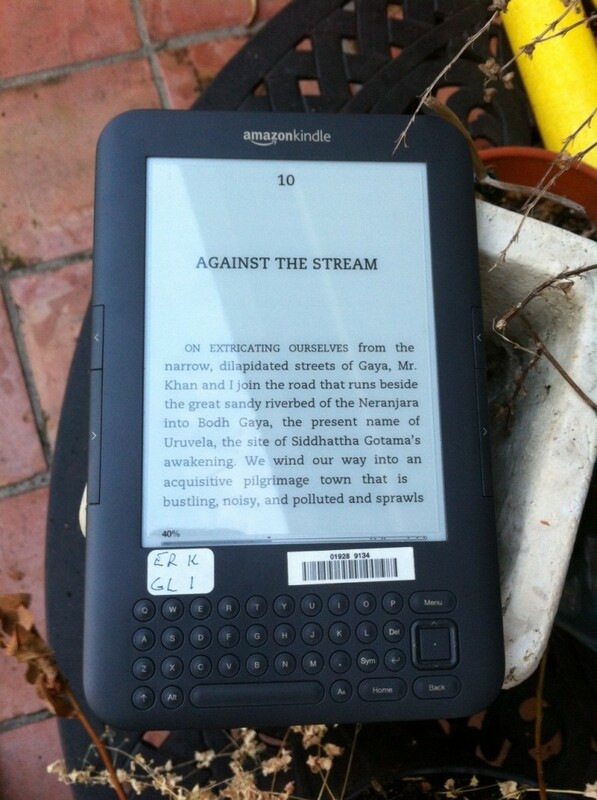 Applied to Kindle e-books, a dummy bookmark is just as effective. A user can walk around the space where stacks are located and physically identify those e-books that the library makes available on a e-book reader in each subject section. 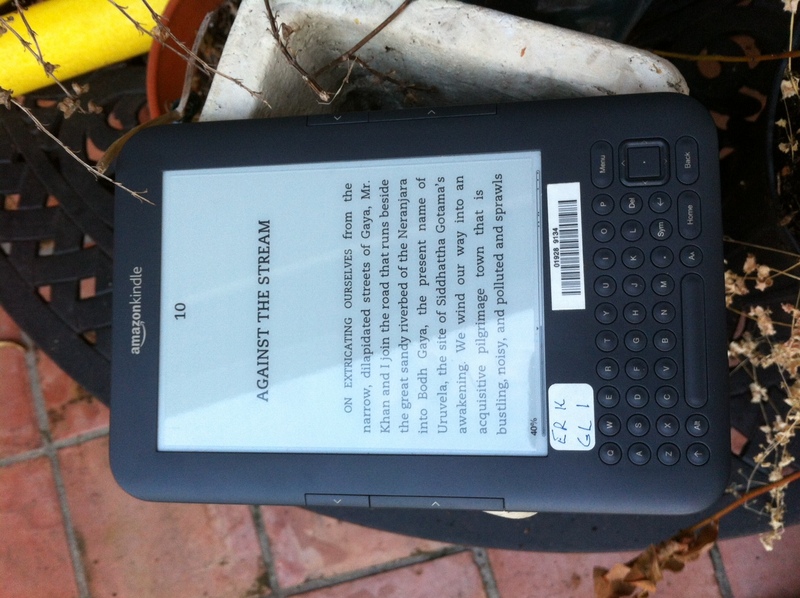 By a visible cue, a dummy bookmarks create a direct sensory association between an e-book and something physical (that provides a visible and tactile feedback) in a user’s mind, thereby effectively expanding a users’ idea of what is available at a library. When you pull out the bookmark, it looks like this. 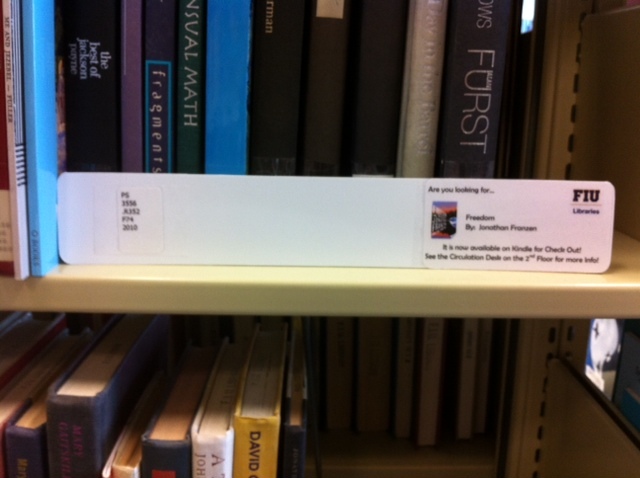 The bookmark includes the book’s cover image, title, author, and call number, which help a user to locate the title record in the library’s online catalog. But in reality, users are more likely to just walk down to the Course Reserves area to check out an e-book reader after reading this sign. I tweeted this photo a while ago when I accidentally found out the idea was implemented while looking for some book in the stacks. (See the disclaimer below.) I was quite surprised by many positive comments that I received in Twitter. 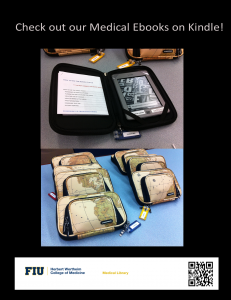 Many librarians also suggested adding a QR code to the dummy bookmark next to the Call Number. The addition of the QR code would be an excellent bonus on the bookmark. It will allow users to check the availability of the title on their mobile devices, so that they can avoid the situation in which the e-book and the e-book reader device have been already checked out. If you are running a pricy e-book reader lending program at your library, a dummy bookmark might be an inexpensive but highly effective way to make those e-books stand out to users on the library stacks. 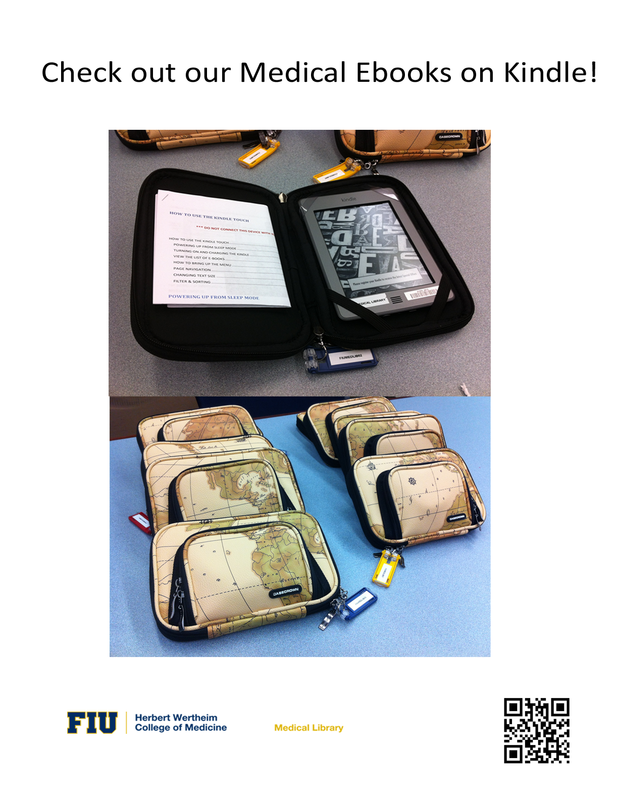 What other things do you do at your library to make your online resources and e-books more visible to users? 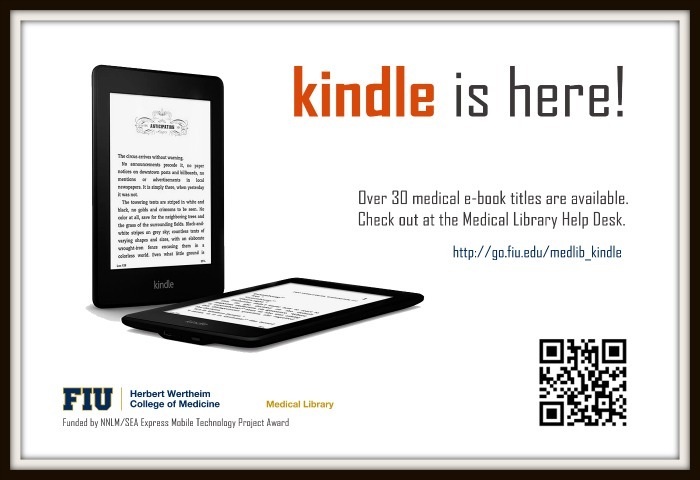 Disclaimer: I have suggested this idea at the E-resources group meeting where all FIU libraries (including Medical Library where I work) are represented. But the implementation was done solely by the FIU main Library for their Kindle e-book collection on their stacks. For those who are curious, I was unable to find the exact number of dummy bookmarks on the stacks.